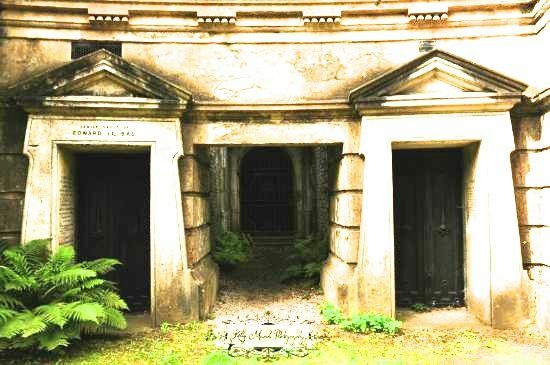 For three months, Anthony and I spent countless hours writing and researching what became “5 Reasons Why a Wampyr Didn’t Walk in Highgate Cemetery” (Feb. 27, 2015). We consulted online and print resources, emailed various people, compared narratives and discussed the article over many, many phone calls. According to his [Sean Manchester’s] narrative, he and some companions entered the cemetery, unobserved by the police, via the damaged railings of an adjoining churchyard, and tried to open the door of one particular catacomb to which a psychic sleepwalking girl [Lusia] had previously led him; but try as they might, it would not budge an inch. Failing in this, they climbed down on a rope through an existing hole in its roof, finding empty coffins into which they put garlic, and sprinkling holy water around. The passage made me think back to “holes” I’d seen in the roof of the Terrace Catacombs during my visit to the cemetery. Had Manchester actually been able to squeeze through them? They looked too small to me. I later asked my partner, who’d accompanied on my visit; he told me the holes looked too small even for his thin 14-year-old son. My questions came hot on the heels of a DMCA takedown notice issued by Sean Manchester on Nov. 18, 2014 over two photographs published in my article “Seeking Vampires in London” (Hogg 2014b). Anthony and I responded with a counter-notification the next day and we’re still waiting for our web host to take action. Manchester’s litigious actions are nothing new; he often uses legal threats to silence criticism (e.g. Hogg 2014a; Lucard 2006). But if he intended to silence me, he achieved the opposite: his takedown notice suggested he had something to hide, so I began digging further. Indeed, the photos he’d forced me to take down were used to juxtapose erroneous claims he made about tomb locations in the cemetery. On Nov. 20, Anthony and I discussed my queries about the holes in the ceiling of the Terrace Catacombs. He suggested I double-check what Manchester said about the event in Manchester’s book The Highgate Vampire: The Infernal World of the Undead Unearthed at London’s Famous Highgate Cemetery and Environs (1985; 1991). The incident is discussed in chapter three in both editions. I spent hours analyzing each edition side by side, comparing paragraphs, highlighting relevant lines—and hit jackpot. I found numerous inconsistencies in his narratives. Even Anthony was surprised: he said having a fresh pair of eyes brought new things to light he hadn’t considered before. Following my queries, I began looking at other locations in the cemetery. Most of the vampire’s activity centred around the Circle of Lebanon in Highgate Cemetery West. I couldn’t find a detailed map of the area, so I knew I had to draw my own. It took me about seven hours and six drafts to draw. I began by sketching the inner circle after consulting Jane Bulmer’s Highgate Cemetery. Saved by Its Friends (2014) to confirm the number of vaults in the inner and outer circle. For the next sketch, I used a geometry set to insert the correct number of vaults and added in fixed points, specifically the two sets of steps leading into and out of the circle. This part was relatively easy because I had a photo at the top of each side looking down into the circle. 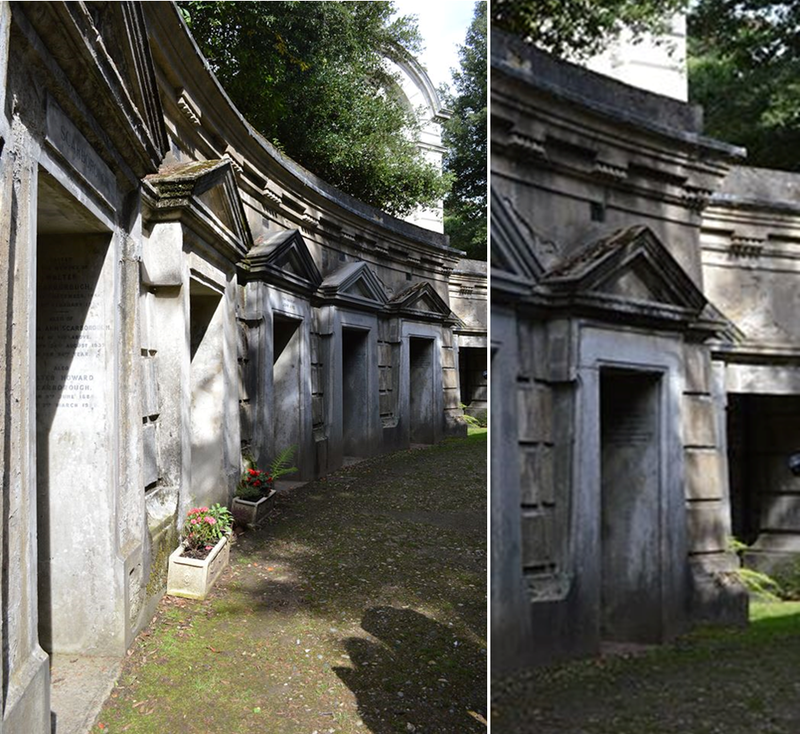 The photos were part of a larger set I took during my visit to Highgate Cemetery on Aug. 30, 2014. I used another photograph from this collection to determine the Egyptian Avenue’s position on the map and its connection to the Circle of Lebanon. Before I drew the third sketch I consulted a bird’s eye view of the Circle of Lebanon from the British Listed Buildings website to confirm the placement of the steps. The Beer Mausoleum and the Terrace Catacombs were added from memory and by cross-referencing my photos. The only location I struggled to confirm on my map was the tomb Lusia was pointing at in Manchester’s book; the same photo Manchester issued a DMCA takedown notice against. It was a smaller opening, almost like a hallway that lead to an entrance directly beneath the Beer Mausoleum. I found the precise location by accident while I was zooming in on one of my photos, trying to read the vault names. During my cemetery tour, the guide didn’t take our group around this side of the circle, but I at least had a rough idea of where it was located due to the position of the Beer Mausoleum. I needed a better photo to confirm the location so I tracked down another photograph of the same area. Unfortunately, it was too dark to tell properly. I imported the dark photo into iPhoto for Mac and played with the lighting and contrasts—until I saw the gate at the end appear. By lightening and contrasting the TripAdvisor photograph, I was able to view the gate at the end of the “hallway” corresponding with Sean Manchester’s photograph of Lusia at the same location. Before sketch four, I entered all the tomb names off my scrap paper into a Microsoft Excel spreadsheet. I made a list for the inner and outer circle and gradually inserted all the names I found with my own photos and random ones online. It was tricky because I needed large photos that could be zoomed into in order to read the names. Next I added the stand-alone vaults and lined up my name lists accordingly. The last couple of sketches was me perfecting the shape and also squeezing in the names properly. I had to go over the pencil sketch with a black fine-liner because when I scanned the map, the pencil version reflected; it was too “shiny” and didn’t show up well. 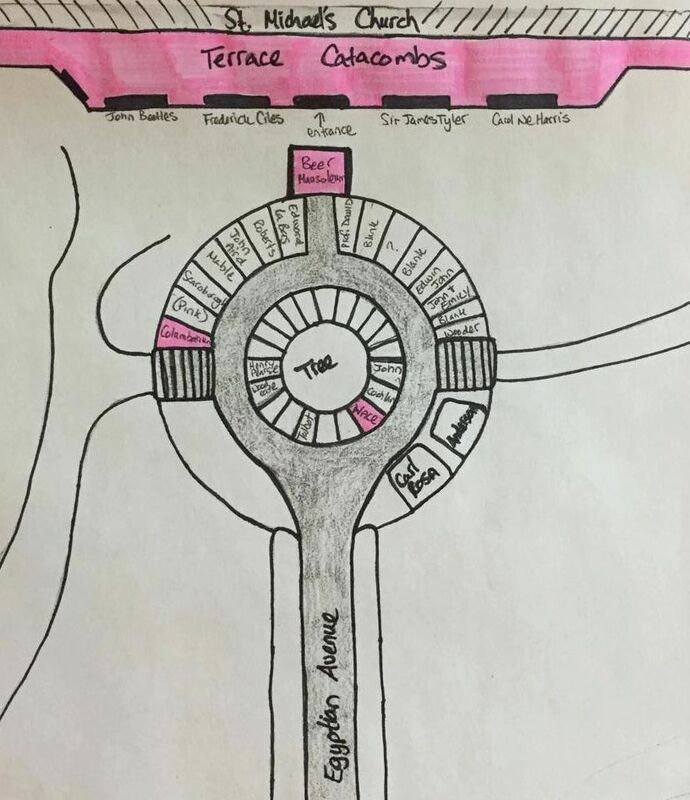 The final draft of this map was imperative for the investigation because it helped pinpoint the key cemetery locations Manchester identified as the vampire’s resting place or places it had some connection to. the Family Vault of Sir James Tyler. You can see them on my map. Areas marked “?,” “Blank” or left unnamed represent tombs with descriptions too difficult to read in the photographs I consulted. Note also the stairs on opposite sides of the Circle of Lebanon: both lead to a higher level, where the Terrace Catacombs are located. I felt that it was time to re-examine the vaults of the Columbarium and their mouldy contents; not least of all the cavernous crypt which contained the three empty coffins. I found Manchester’s statement odd, because columbaria are usually used to house urns containing cremains, not coffins (“Columbarium” n.d.). Manchester also mentioned the Columbarium many other times in his book (Manchester 1985, 24, 33, 46–7, 53, 54, 119); though I later discovered he was mistakenly referring to the Circle of Lebanon. 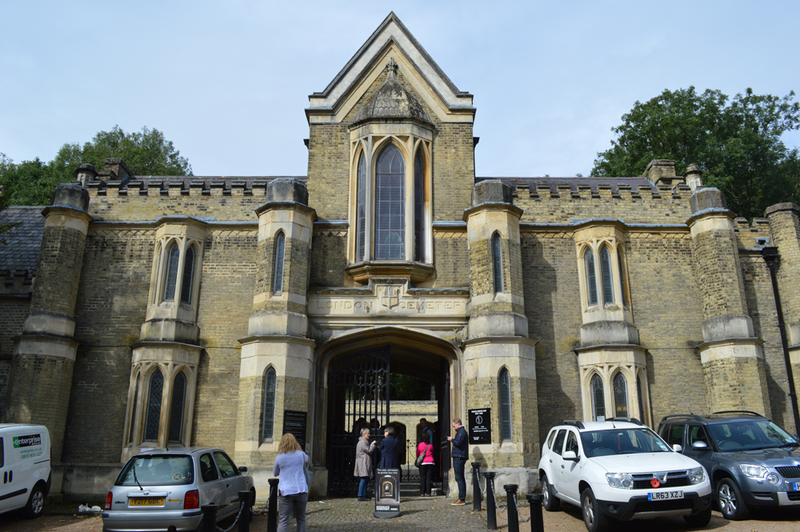 I was doing some research on catacombs and I was interested in Highgate Cemetery West since I actually visited there from Canada in September [sic] and had a lovely tour. My question was regarding the Columbarium and the Terrace Catacombs. 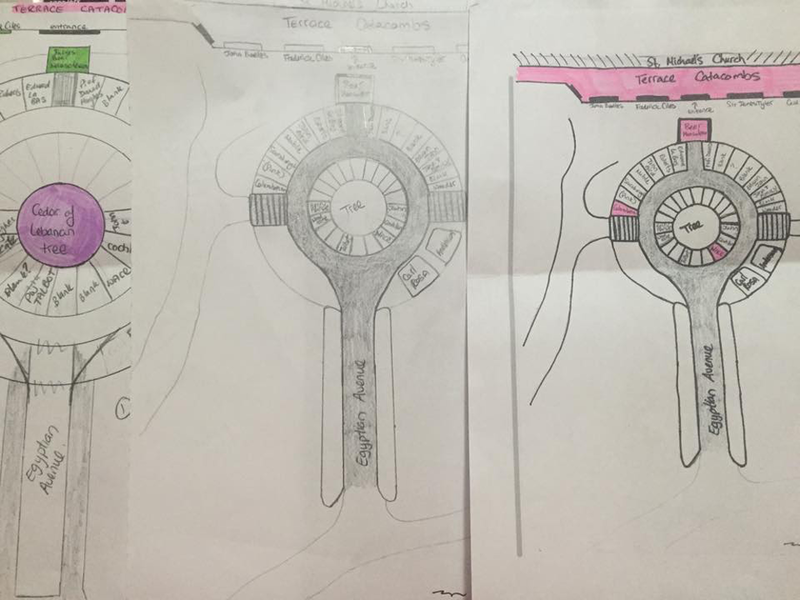 If memory serves correct the Columbarium is located in the Circle of Lebanon. To my understanding the Columbarium only houses urns and not coffins. Can you confirm this for me? Also is there any way to access the Columbarium besides the front gate? If my understanding is correct it is located underneath the Mausoleum in the Circle of Lebanon?¹ Is it linked to other adjacent vaults? How many urns did the Columbarium hold and do you have any photos of what it looks like inside available online? 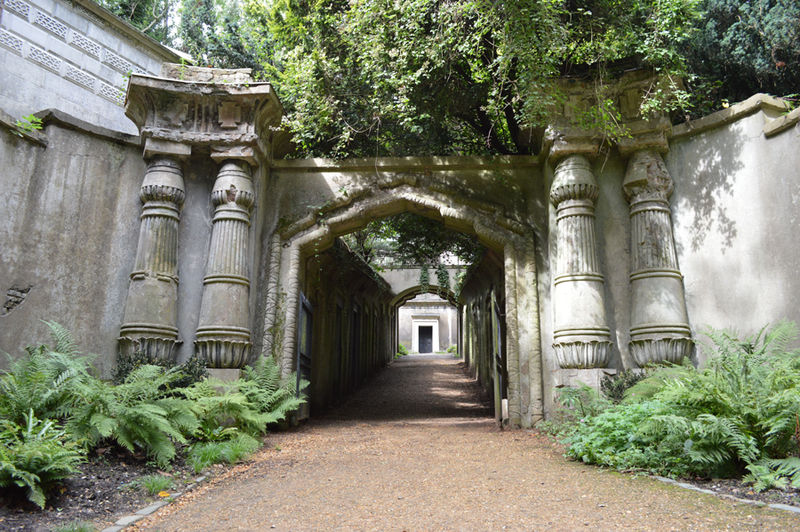 Lastly, regarding the Terrace of Catacombs I have the information in the Highgate Cemetery Book I bought when I was there and it explains that they housed 825 recesses. Can you confirm if each apertures was seals [sic] with inscribed slabs or small glass inspection windows? I found that it used to cost 10 pounds for a place in the Catacombs. Do you know what was the last year that a space was sold in this area of the cemetery. Sorry for all the questions, but if you could either help me out or put me in touch with someone that could that would be amazing. I emailed the [Highgate Cemetery website] general info account and didn’t receive a reply yet so I was hoping you could perhaps direct me to the right person to speak with. 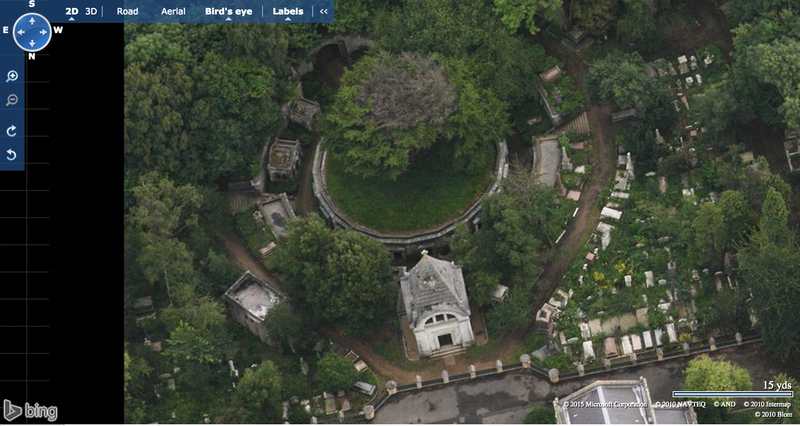 I am doing a research project on Highgate and I had some questions about the Terrace Catacombs and Columbarium. I visited there from Canada in September [sic], but had a few questions. If you could help me out that would be great. Thank you for your email. I deal with arranging burials and the granting and legal transfer of exclusive rights of burial and not with general enquiries. You will no doubt receive a reply to your original email in due course. As of writing this I haven’t received a response from Highgate Cemetery. Since the cemetery was taking its sweet time, I figured I would try another avenue. On Dec. 19, 2014 I reached out to the other major player in this case, David Farrant via email. I was hoping David could shed some light on questions regarding the Beer Mausoleum and Terrace Catacombs. It seemed logical to contact someone involved with the actual case back in the day. Going full circle to the “holes” in the Terrace Catacombs roof, David was able to confirm they were sealed with glass and certainly not big enough for Manchester to squeeze through. He also explained there was no way to gain entry to the Beer Mausoleum from the lower entrance in the Circle of Lebanon. I found so many inconsistencies in the sections of Manchester’s book I reviewed that my article was turning into a 10,700+ word monster. It started to overwhelm me; I had no idea there’d be so many plot holes to cover. The more we edited the article, recurring themes began to emerge and we were able to narrow down Manchester’s flawed account into specific categories. Anthony came up with the idea of using subheadings for the article. This meant we had to shuffle things around; we ended up with ten sections. He debated splitting the article into separate posts because we had so much content to work with. One article would focus on Manchester’s geographical mistakes and the second would address questions I had after reviewing chapter three in his book. This lead him to the list concept; turning the article into a “listicle.” The benefit of a list format was it would condense the article even further, which meant more editing. To get an understanding of how much editing this article went through, I will explain our process. Anthony and I like to do what we call “live editing.” We use a remote access program called TeamViewer which allows us to remotely access each other’s computers. Essentially, he can see what I can see and navigate too. We then work our way through the article while talking on the phone using Viber. For the first article and this blog entry we have clocked at least 170 hours on the phone for editing and discussions purposes. This article was probably one of the more gruelling ones we’ve tackled yet. It even beats my Vampire Facials article and Charles Runels interview from last year, which were both doozies to write and took two months combined! ¹ I made a mistake when typing my email and questioned if the Columbarium was located beside the Beer Mausoleum when it is not. Bickersteth, Justin. 2014. E-mail message to author, Nov. 26. “The Catacombs and Terrace in Highgate (Western) Cemetery, Camden.” n.d. British Listed Buildings. 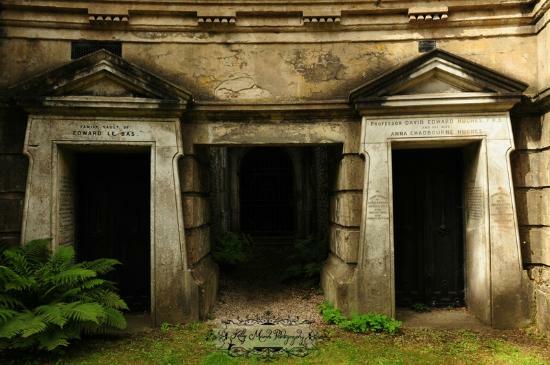 Accessed April 2, 2015. http://www.britishlistedbuildings.co.uk/en-478284-the-catacombs-and-terrace-in-highgate-we. “Columbarium.” n.d. Wikipedia, last modified Jan. 17, 2015 at 14:38. Accessed April 2, 2015. http://en.wikipedia.org/wiki/Columbarium. Hogg, Anthony. 2014a. “My Number One Fan.” The Vampirologist (blog), April 30. Accessed March 14, 2015. https://thevampirologist.wordpress.com/2014/04/30/my-number-one-fan/. ———. 2014b. “‘Vampire Hunter’ Hammers Stake Through Article.” Vamped, Nov. 27. Accessed March 14, 2015. http://vamped.org/2014/11/27/vampire-hunter-hammers-stake-through-article/. Lucard, Alex. 2006. “What Everyone Has Been Waiting to Hear.” Icon. Showstoppah. Main Eventah. (blog), Dec. 12. Accessed March 14, 2015. http://www.alexanderlucard.com/wordpress/?p=4. SAVCC. n.d. “Vampire Research Society.” The South African Vampyre Culture Center. Accessed Nov. 23, 2014. http://vampyreculturecenter.wordpress.com/misconceptions/the-science-of-vampyres/non-vc-sites-posing-as-information-resources-about-the-vc/the-vampire-research-society/. For more on the Highgate Vampire case, check out Did a Wampyr Walk in Highgate?, join its Facebook group and like its Facebook page.